Your podcasting tools and the content you are going to create are the pillars of your podcast. In podcasting, it’s not just about being able to deliver your content. If you want to stand out, you need quality. You can have the ability to enhance your delivery by utilizing different tools. Whether through a great microphone, a good audio editing software, or just about any other gadget, you have the power to bring out the best in every show you produce. Cost is not always a measure of quality. You can produce great shows with great quality audio by utilizing free tools. The point is, having a great collection podcasting resources should be able to help you be as economical as you can, but still at par with the standards and the kind of quality you would like your audience to experience. In this page, I have listed some of the podcasting tools that I have used and my clients have used. some are for free, but the others are a good investment that you may consider as you continue to improve your setup and your show. I’m an Adobe Audition user and I don’t see myself switching to another platform anytime soon. I think Audition offers a really great tool that makes editing a breeze. Multi track editing, a whole bunch of effects that you can use and lots of tutorials to help you get better makes it even more appealing. Audacity is an open source audio editing and recording tool that offers a robust list of features. You can use it on different OS platforms without any problem and there’s also great support from the community of Audacity users. 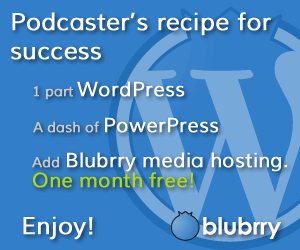 Blubrry is one of the leading podcast media hosting providers and is the creator of the Blubrry Powerpress Plugin for WordPress. Simple Podcast Press is the Ultimate marketing plugin for your podcast. It’s got great features including integration with email marketing software so you can gather leads from your listeners. It has a nice looking player that you can customize to your liking and some great surprises like the ability to view your podcast international reviews right from your WordPress dashboard. In addition, you can also use the time stamps so your audience can just click right to the specific section of your show and listen to that audio right away.